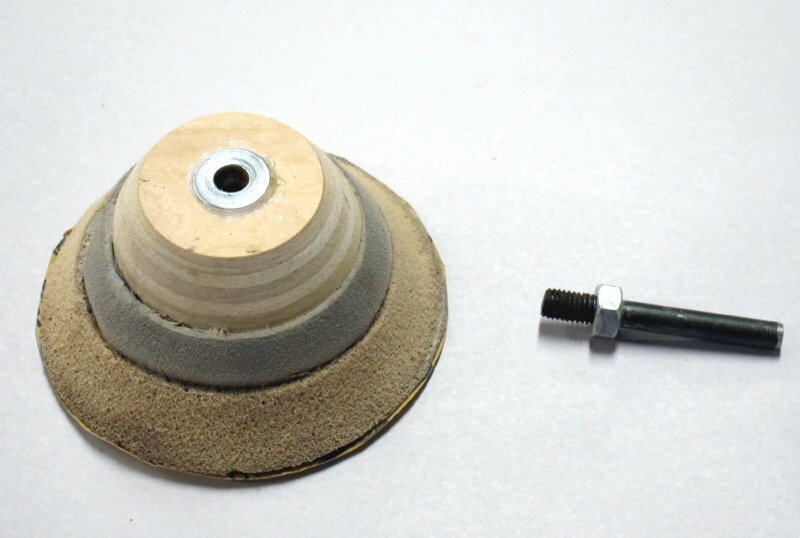 To make a custom sander (everyone is a little different, this is the last one I made, trying to make it duplicable), I bolt on a 2.75" hard rubber sanding disc or a piece of 5/8" plywood to the Makita GV5000 shaft, tightening the nut firmly, as it will be buried from now on. You can buy one refurbished for around $5 from various places, though it's the GV5010 that is more commonly available these days. I just got one on Amazon from ToolsNow. The GV5010 is a bit heavier and a bit louder, though it seems to run a bit more smoothly and has a better locking button. 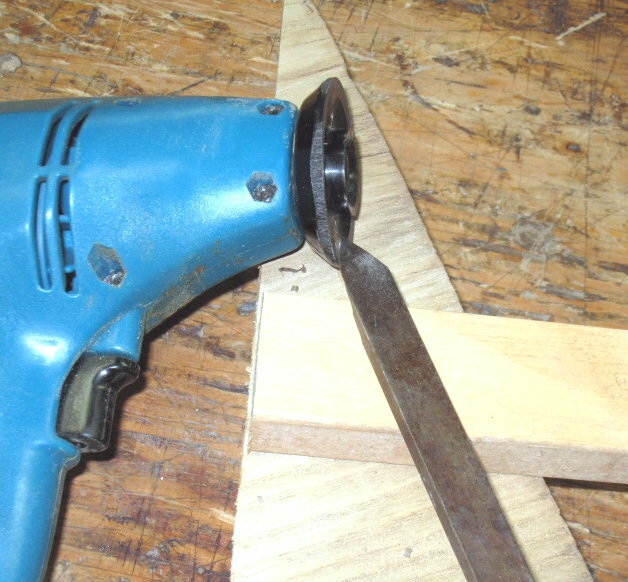 The sander ready to bolt plywood on securely, i.e. good and tight with the M8x20 socket screw that comes with the sander. and tightened that down real tight, and that seems to work about as well. 3 1/2 to 4". A large mouth canning jar band is a fine template but a little small. The small mouth will give you a 3" circle. Spay the glue on all sides to be attached, leaning the two foams up against a waste block to reach the second sides. 1/2" grey EVA foam on the yellow, and finally the whole stack onto the plywood. See the bottom of this page for the FoamOrder specs on the foam, or go to the Sanding Tips page. 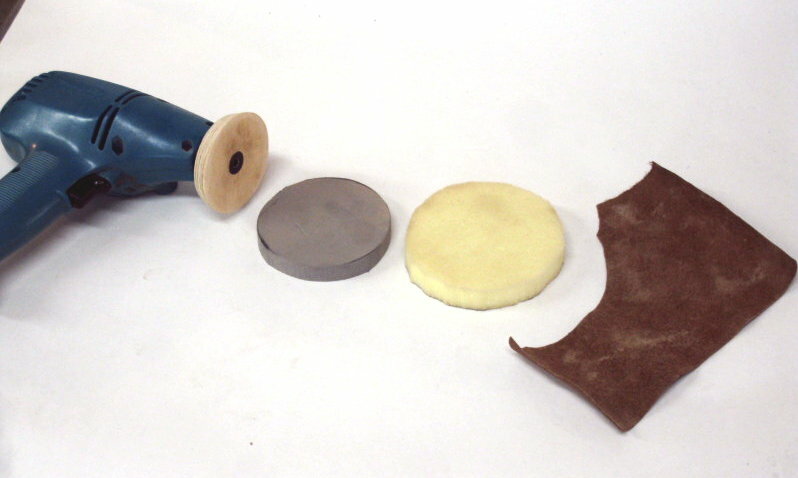 Here are all the layers glued on, with the leather waiting to be trimmed by sharp scissors. 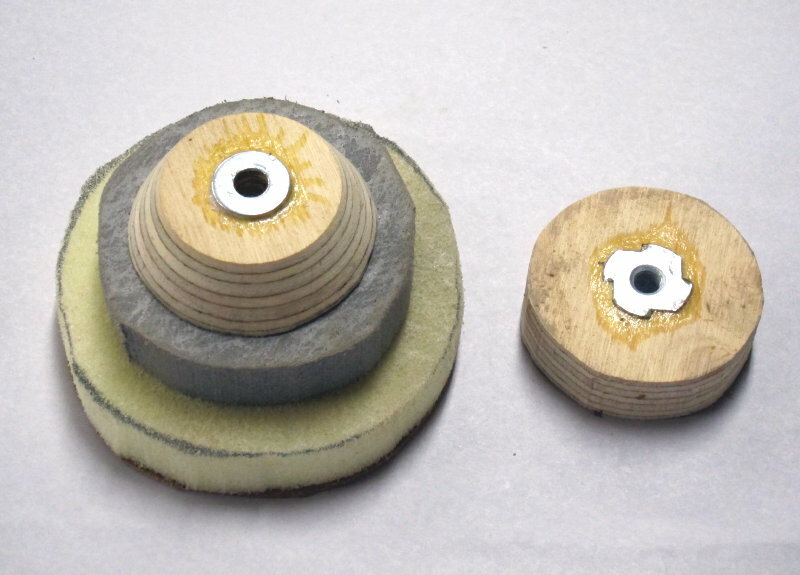 The last two layers are the ones that get torn up in a catch or such while sanding, and often have to be replaced. on the leather that it becomes too stiff to keep using. 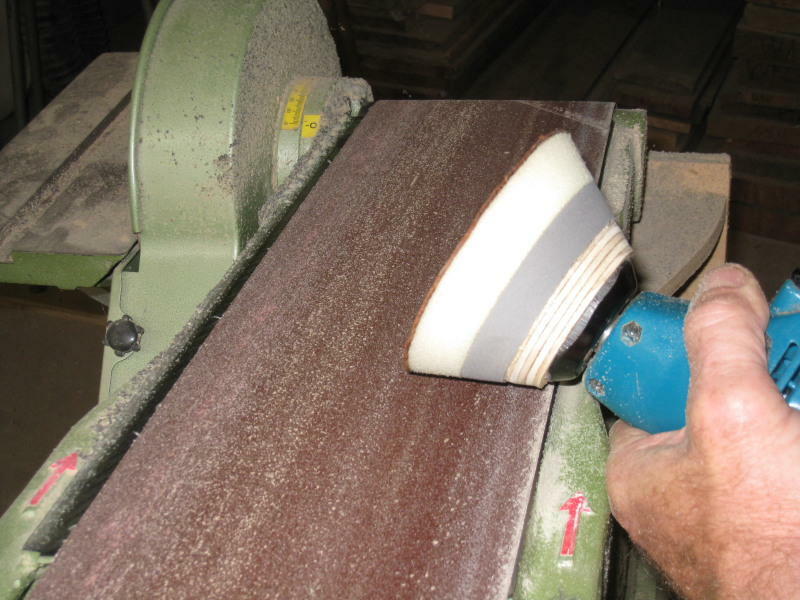 Then I hold the spinning composition against a stationary belt sander and work it to about a 45 degree bevel. 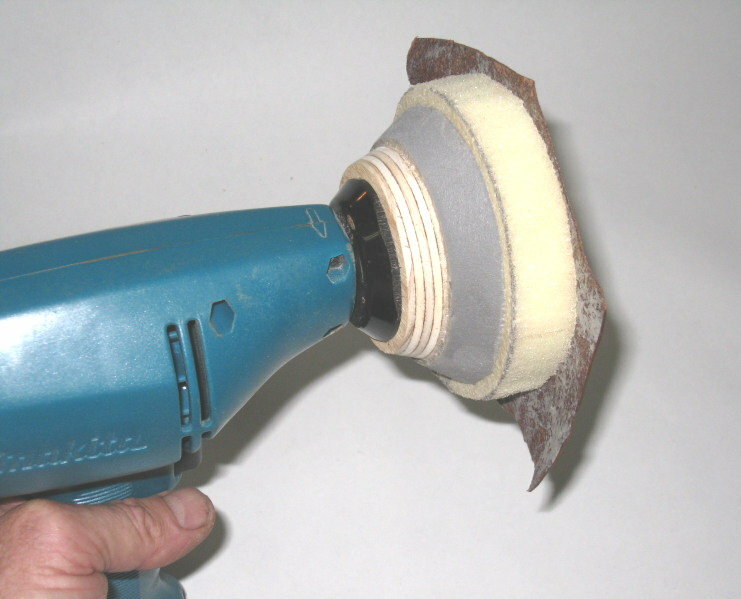 If all goes well it will run nice and true, but don't press too hard against the sander of the flex of the foam will lead to an oval disc. 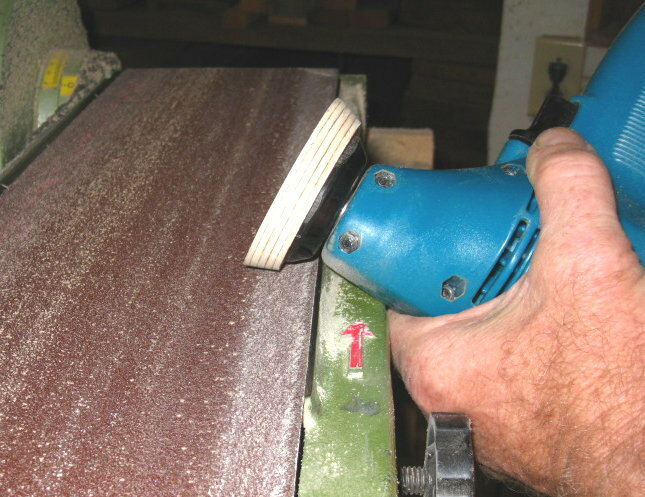 Here is a recently constructed sander with a plywood substrate being sanded even on the belt sander. Stop a few times and use scissors to cut off any leather that is running extra wide in places. This will help the sander cut it clean and true in the end. 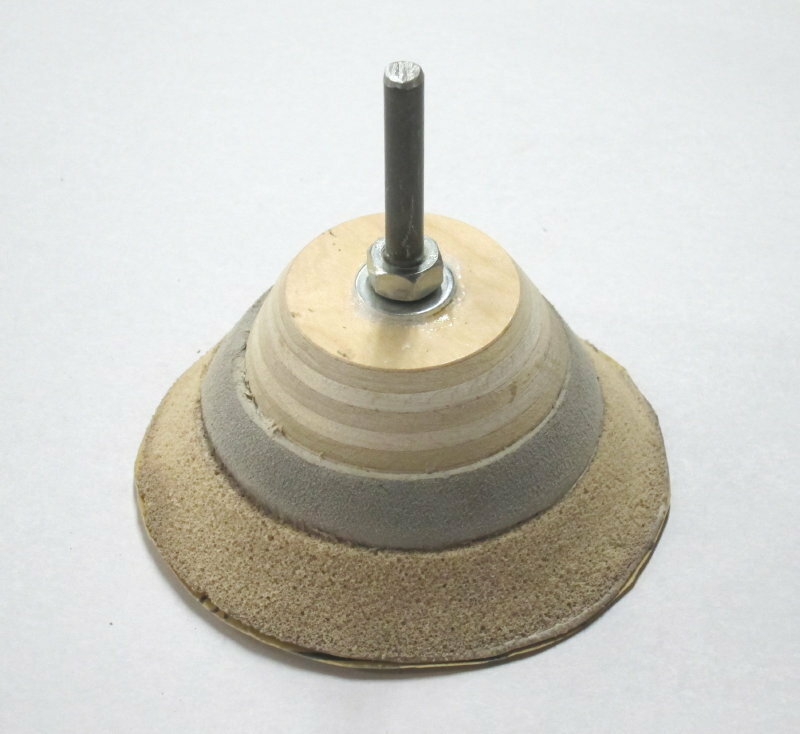 Alternatively, one can make up a detachable spin on base and glue the foam to that. the base plywood with 1.25 x 8 mm T nut on right, and with foam glued up to the sanded base on the left. 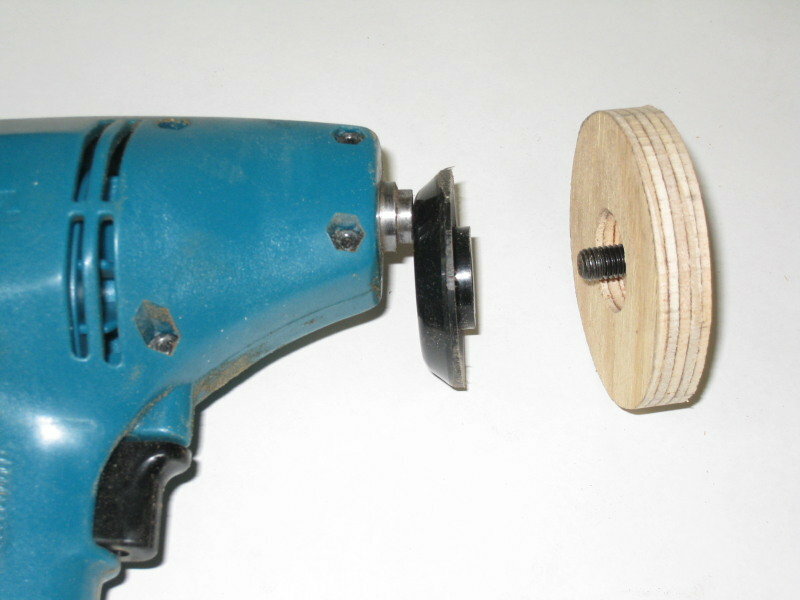 This way one Makita sander can serve all the made up discs with varying grits. 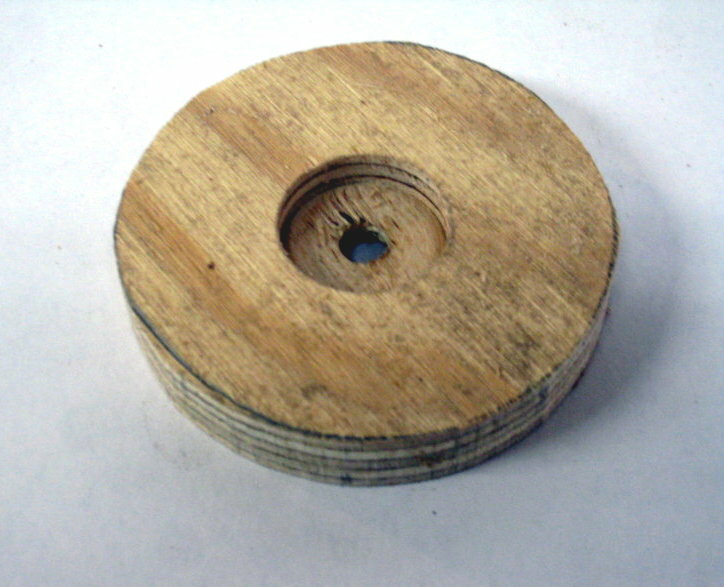 nut providing the shoulder to screw the sanding disc onto. 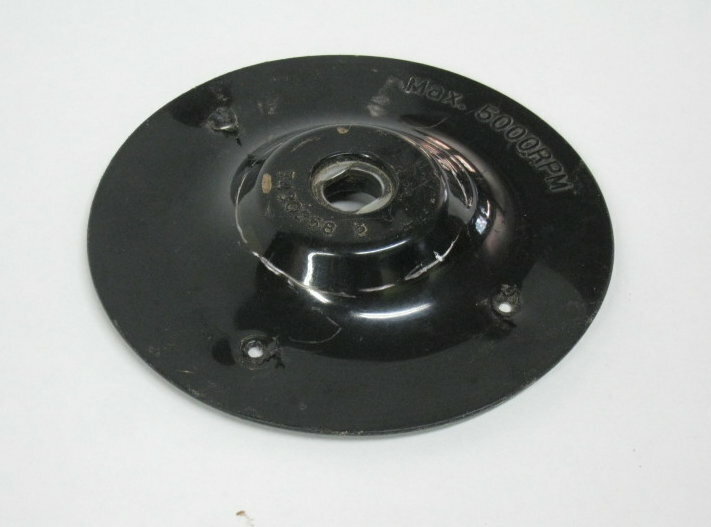 and the sanding disc with mandrel bolt screwed in. It is easy to enter a size such as .75” x 24” x 24”, and get a list of types, their prices, and descriptions. 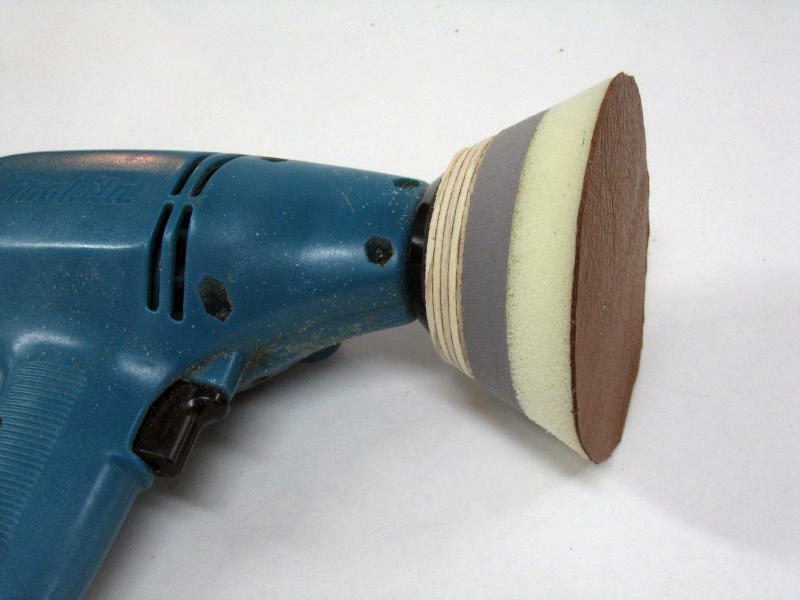 I tried numerous types, and found the best for my sanding purposes to be the DuraFlex D44, with a density of 2.25 lb/ft3, and ILD 40. It used to be the only blue one on the page, but my last batch was yellow. A 2’ square piece 3/4" thick runs about $8.25 + shipping. For the denser grey foam that is applied below the DuraFlex D44, I use the EVA closed cell foam, available at Foamorder at http://www.foamorder.com/closedcell.html A .2' square piece 1/2" thick runs $12 plus shipping. I now go 3/4 thick. 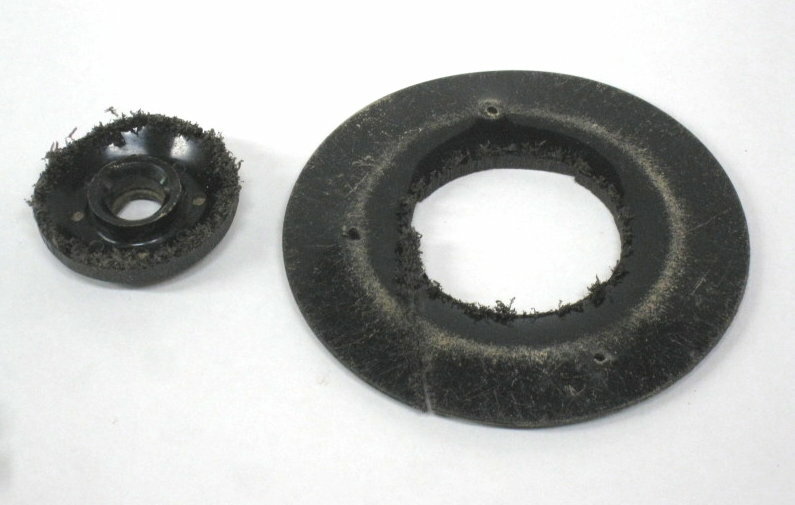 The 3M 90 does not degrade the foam, though it does slowly de-bond after heavy use. But at that price, no problems. Just gluing on another piece when it gets too worn. I used to use 3M 77 Spray Adhesive to glue the foam to sander, leather to foam, but I find the 3M 90 considerably superior in ease of application, tenaciousness of grip, and in resistance to heat. It is well worth the extra dollars. Insist on it. Spray both sides and wait a minute or so until it is no longer wet but not altogether dry, and press together. I can use it after only a few more minutes, though it is better to give it half an hour. If the sander catches on an edge or in a crack and begins to rip loose, spray the 90 into the folded back leather, wait, and press to resume sanding. 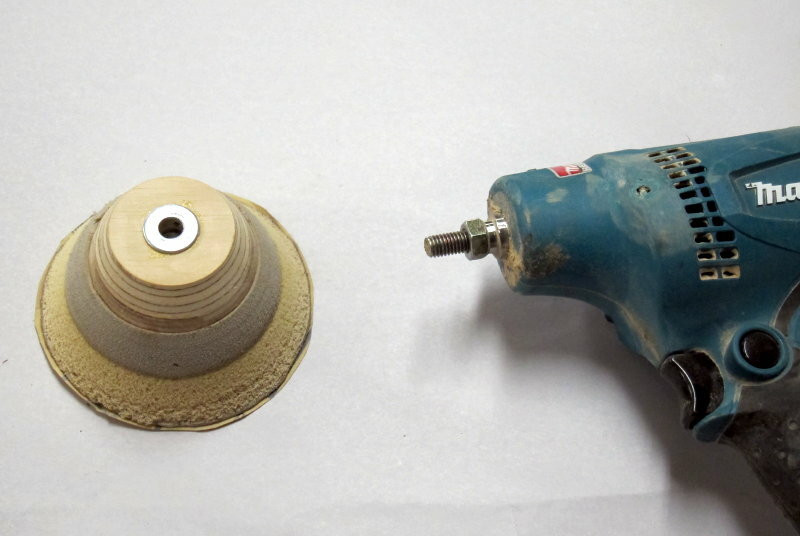 But after you do this a few times the glue becomes too thick and stiff for smooth sanding. When it comes time to replace the foam I take the time to sand the 3M 90 off the leather on the stationary belt sander before re-applying.